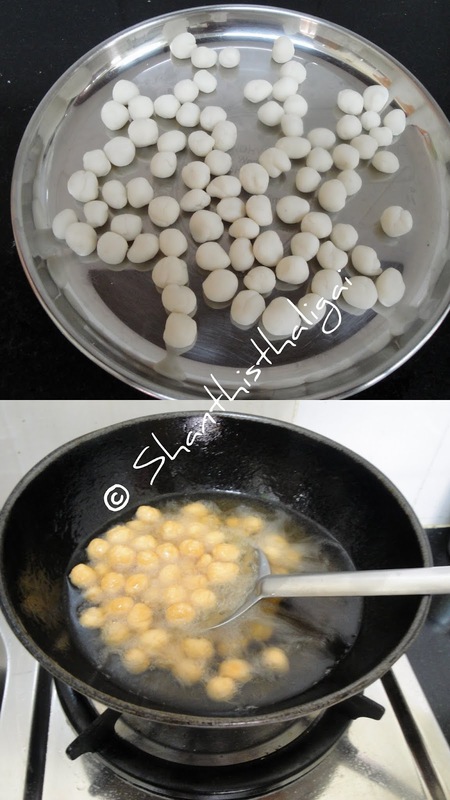 Seedai is a popular snack made for Sri Krishna Jayanthi/Gokulashtami. Usually, seedai is done with processed rice flour. While talking with my grandma yesterday, she told me about making maida seedai and also said that it will be "vella velaer" (a beautiful golden colour without browning) in colour. Maida has high gluten content and when steamed it breaks down the gluten and makes it easily digestible. Prepare urad dhal powder as said in this link. Tie maida in a clean white cloth and steam cook for 15 minutes. When still warm to handle, break well to powder without any lumps. Sieve well. Mix water and coconut milk and keep ready. Crispy and crunchy maida seedai is ready for offering. Coconut oil enhances the taste, but any other edible oil can also be used.